The 286 kilometers of Route 66 in Texas cuts across what is known as the ‘Texas Panhandle.’ A ‘panhandle’ describes a narrow part of a territory that extends from the main part of the state or territory. This stretch of the Mother Road is flat, hot, and very dry. Our first stop was the town of Shamrock. Irish immigrants settled there in the 1800s. Shamrock holds on to its Irish culture; the city holds a big St. Patrick’s Day celebration each March. The historic U-Drop Inn was once a famous hotel for Route 66 travelers. Now, it is a friendly visitors center and a common place for travelers to talk and enjoy some coffee before hitting the road again. The center displays photographs from Route 66's early period. There are even vintage hats and clothes for visitors to try on. 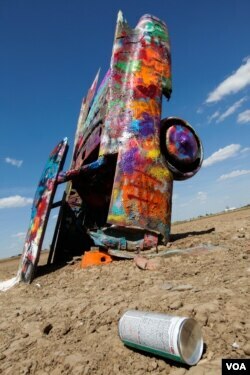 From Shamrock, we visited one Route 66’s most famous roadside attractions – the Cadillac Ranch, in Amarillo. A local millionaire let a group of artists put 10 old Cadillac cars on his desert property back in the 1970s. The cars are partly buried. They rise high from the ground, their engines pointing to the wide Texas sky. The artwork is meant to represent the golden age of cars. Nowadays, plenty of tourists visit -- with containers of spray paint! Visitors are permitted to paint the cars with bright colors. The stark desert landscape makes for a beautiful background. The immense openness along this part of the road makes it easy to see how the expression "Everything's Bigger in Texas" came about. ​Travis McCallister III from Lubbock, Texas visited the Cadillac Ranch. We asked him what he thought about the Texas expression. "Well, it's bigger pride. When you go overseas, you don't say you're from America, you say you're from Texas. I mean, we're bigger in the heart." Fran owned Midpoint Café for 23 years before selling it and retiring. She soon became bored, and decided to open a new business next door to her former café. "I became too lonesome to meet people from all over the world. And they do come to the midpoint, which is in Adrian, Texas, which is a wonderful place to be." Fran is friends with our new friend Melba, from our trip across Kansas. It is yet another example of Route 66 locals knowing and supporting one another. These relationships are an important part of preserving the Mother Road’s past and supporting its future. vintage - adj. used to describe something that is not new but that is valued because of its good condition or attractive design.